Animals Painted in a Bold And Colorful Style! Well, it was my intention to blog once a week so this is late, but I want keep on the subject of commissions and working with collectors. 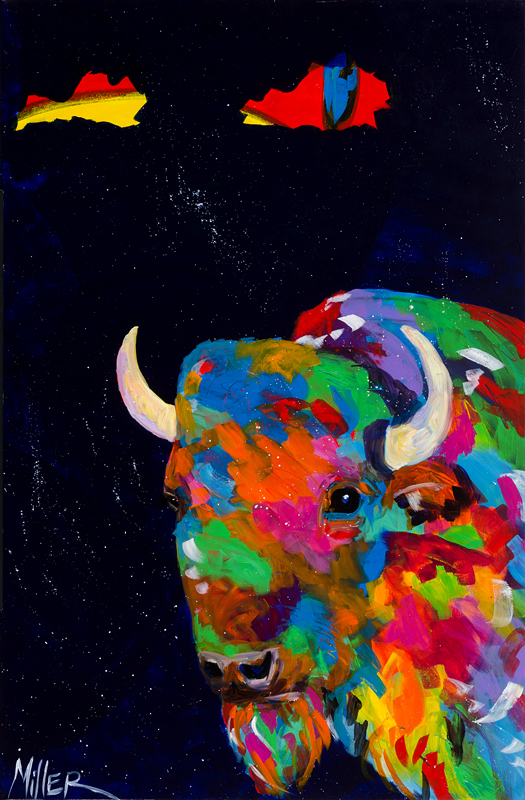 This is a recently finished painting for a Denver collector who was looking for me to paint a buffalo similar to an earlier one I did but to change to a very specific size. Narrower and taller so it could fit into a recessed area facing the front entryway and with a different color background. I sketched out a new placement of the buffalo within the parameters of the canvas and got the go ahead. The painting turned out really nice and the collector was also happy.This one is titled"Contentment"